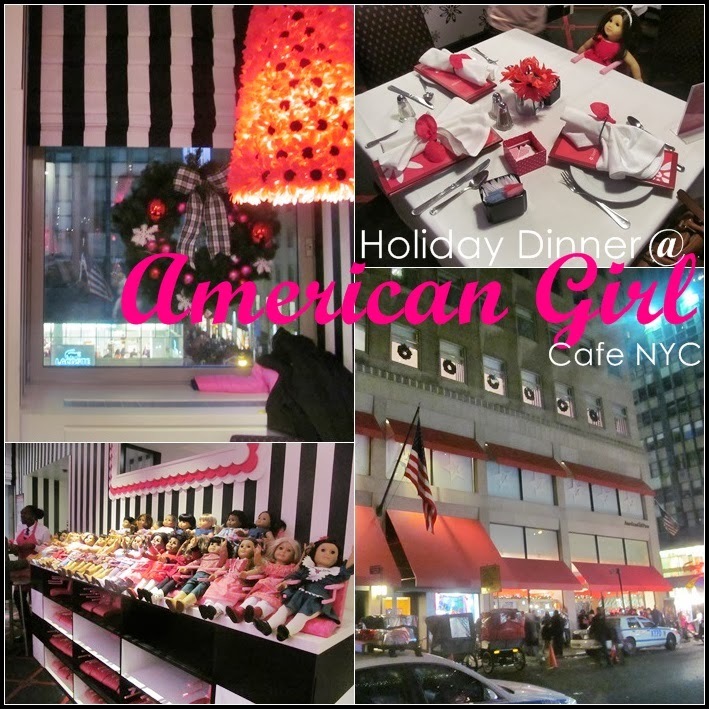 Over the last few years we've made it a family tradition to visit the American Girl cafe for a special girls day out with my mother-in-law, Arianna, and I. (You can see our previous Tea Time video here). This time around we decided to do something special, and not only have dinner at the Cafe, but also do it right before the holidays too! It was a truly special day, and one that we will remember forever. If you have a daughter, I couldn't recommend it enough! The experience at AG cafe was excellent. We dined in the the private Daisy Room which was a very pleasant surprise since I hadn't reserved it - but who am I to complain?? When you first arrive, you're welcomed with warm cinnamon buns, followed by an appetizer tray full of veggies and artisan bread with dipping sauce. The menu has numerous choices for children and adults to choose from, and is later topped off with a "Sweet Surprise" of chocolate mousse and cake at the end. For the price of $26 a meal and the quality of the food, and the experience, you really can't beat it. Can't wait for next year!